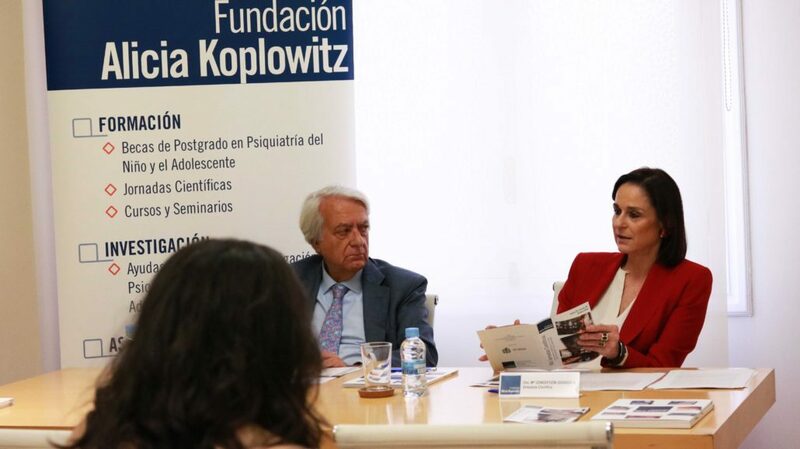 Leoncio Areal, patron-secretary of the Alicia Koplowitz Foundation, and Dr. María Concepción Guisasola, scientific coordinator of the Foundation, presented the Foundation´s XIII Scientific Conference during a press conference held at the headquarters of PROA Comunicación. The conference will be held on 25 and 26 October at the Ilustre Colegio Oficial de Médicos de Madrid. In this edition the presentations and round tables will focus on ‘Mental health in adolescence (13-17 years): Healthy development, risks and opportunities’, thus closing the cycle that began two years ago, when the Foundation decided to address mental health in the different stages of the life cycle of children and adolescents. This vital period, informed the Foundation’s scientific coordinator, is one of the most productive stages of life, “but not all development during these years is positive, especially given the increasingly digital and competitive environment in which most of our adolescents live.” Among the most common mental disorders at the time, she noted “anxiety, depression, alcohol and substance abuse, or eating disorders,” in many cases caused by the search for self-identity. Additionally, she put special emphasis on cyberbullying, a phenomenon that has appeared with technological advances and the emergence of social networks and will also be addressed in the conference. The doctor cited as an example a Microsoft report that shows that 37% of users between the ages of 8 and 17 around the world have reported being victims of cyberbullying, and 24% are authors of said cyberbullying. The XIII Scientific Conference of the Alicia Koplowitz Foundation will be inaugurated by Dr. María Concepción Guisasola, who will give a brief introductory talk on adolescence, and will include five round tables, two master conferences and a conference for scholarship holders, as well as the ceremony for the awarding of Research Project Grants, which will be given by the President of the Foundation, Ms. Alicia Koplowitz. The first keynote lecture, late Thursday morning, the 25th, will be given by Sarah-Jayne Blakemore, Deputy Director of the UCL Institute of Cognitive Neuroscience in London, who will illustrate to attendees ‘Adolescence as a sensitive period for the social development of the brain’. It will be presented by Dr. Gisela Sugranyes, Child and Adolescent Psychiatrist at the Hospital Clinic de Barcelona. The round tables will be attended by renowned professionals such as Dr. Susana Monereo, Dr. Javier Urra, Dr. Marta Rapado, Dr. Veronica de Miguel Luken, Dr. Rosa Calvo, Psychologist Patricia Escriva Martínez, Dr. Josep Matali, Dr. Dolores Mosquera Barral, Dr. Hilario Blasco Fontecilla, Dr. Pedro Manuel Ruiz Lázaro, Dr. Cristina de la Cuerda, Dr. Luis Beato, Dr. María Mayoral, Dr. Blanca Reneses, Dr. María de Gracia Domínguez and Josefa Aymat Molina, the president of Adaner (Asociación para la Defensa de la Atención a la Anorexia Nerviosa). They will address issues such as hormonal changes in puberty and the psychosexual aspects associated with them, risk behaviors (behavior disorders and transgressions), affective-sexual education in the 21st century (gender violence, sexuality in adolescents with Autism Spectrum Disorders), the reward system and risky behaviors (new technologies, self-injurious behaviors), eating disorders and the transition to adulthood. The scholarship holders’ conference, which will open on the afternoon of the first day, will be given by Dr. Laia Villalta, Child and Adolescent Psychiatrist, Unit 0 to 5 years old and Functional Unit for Child Sexual Abuse Care (UFAM) at the Hospital Sant Joan de Déu de Barcelona and former scholarship holder of the Alicia Koplowitz Foundation. It will be presented by Dr. Marta Casanovas, Child and Adolescent Psychiatrist at the Hospital Sant Joan de Déu de Esplugues (Barcelona) and also a former scholarship holder at the Alicia Koplowitz Foundation, and will talk about `Emotional Dysregulation and Trauma in Adolescents’. The meeting will conclude late on Friday morning with a keynote address by José Antonio Marina, professor and PhD in Philosophy, educator and writer, who will speak on ‘The talent of adolescents. The second golden age of learning’, after being presented by Dr. Luisa Lázaro, head of the Department of Psychiatry and Child and Youth Psychology at the Hospital Clinic de Barcelona.